An angle grinder is one of the most useful power tools around, with an extremely wide range of applications. That’s why a good angle grinder can easily find a place in the toolbox of any well-prepared contractor or DIY enthusiast. For that same reason, there are a lot of models on the market today from a wide range of manufactures. Today, we’re going to look at five of the best angle grinders on the market. We’ll look at each of their stand-out features and evaluate each of their pros and cons to help you decide which tool is best suited for you and your needs. What is an angle grinder? What can you do with an angle grinder? How to use an angle grinder? How to choose an angle grinder? How to change the blade on an angle grinder? Despite bearing the name of such a well-recognized manufacturer as Hitachi, our first product on the list is also our bargain entry, boasting a price tag well below any other model on this list or elsewhere. Despite that low price, this is still a high-quality product that packs a lot of useful features. The first thing that many people will look at when assessing angle grinders will be the motor size, so we should probably start there too. Having a power of 6.2 amps is respectable, but for an item with a size of 10 x 4 x 4 inches and weight of about four pounds, it is a little underpowered. Aside from that, it boasts a spindle type of lock for quick release of the blades and the paddle style trigger includes a locking device for ease of use during prolonged handling. The motor has excellent overload durability too, which is always a useful feature in grinders with smaller engines, while the side handle is removable and can be mounted to both sides. The good thing about this tool is that for a relatively small amount of money, you are getting an awful lot of grinder. Hitachi has really done a lot to fit so many beneficial features into a very basic design. It is underpowered and a little heavy compared to its rivals, but it probably has enough going for it to be an excellent stand-by model for more occasional uses. The only real issue with this tool is that it is a bit of a basic model, which means it lacks a lot of the bells and whistles found on tools from the premium end of the market. So, that means we have a bit of an underpowered motor with this tool, at least compared to many other models on the market. The dust extraction system is also pretty weak. 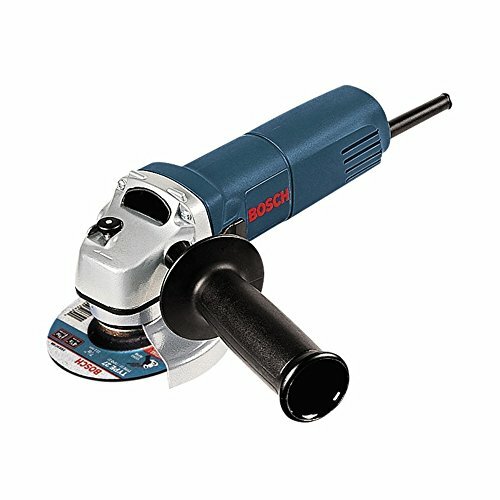 Bosch is, of course, one of the most recognizable names in the world as far as power tools are concerned. 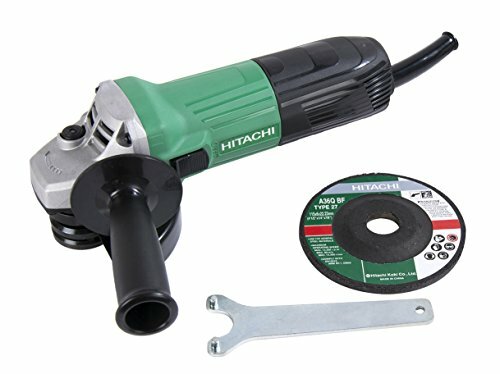 They have a deserved reputation for producing some of the most excellent tools, and with this angle grinder, they have worked hard to pack a lot of features into a very small body. The main highlight of this tool has to be its tiny size! It is about 26cm in length, barely 10cm thick, and weighs 3.75 pounds. With such a small body, Bosch has only been able to integrate a six amps motor into the design, though this is not necessarily the drawback as you may assume it to be. That is because it has a maximum speed of 11,000 RPM as well as a power of one horsepower. Aside from that, the model boasts a comfortable, ergonomic design to both the main body and the side handle. The power switch has a lock for extended operation, which is also used to lock the switch when the product is turned off, preventing any accidents. Similarly, it is also completely enclosed and protected to prevent dust and debris from entering the tool. COMPACT: Weighing only 3.75 lbs., the Bosch 1375A Angle Grinder is lightweight, compact, and ideal for metal workers, vehicle fabricators, plumbers and other professionals who use grinders on a daily basis. POWER: The angle grinder features a powerful 6.0-amp motor to produce 11,000 no-load rpm for professional cutting and grinding applications. The efficient motor was designed with an extremely small field diameter, letting the user grind or cut with ease. COMFORT: The 1375A offers a two-position side auxiliary handle specifically designed to angle to a natural position for maximum operator comfort. The top handle of the angle grinder is also ergonomically designed. 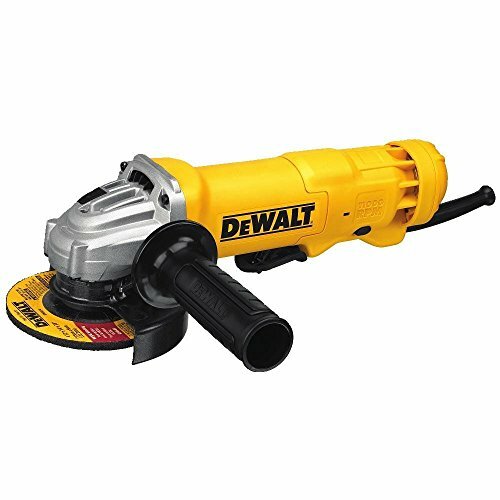 DURABLE: The 1375A angle grinder features an epoxy-coated design to protect the tool from abrasive debris. It was also designed with a sealed switch to keep dust and debris from entering the switch mechanism. This tool has certainly been designed with comfort at its heart. When you combine an ergonomic body and handle with such a low weight and small size, you are going to end up with a tool that is very easy to hold and use for prolonged periods. That small size is also one of the big advantages, and if you need an angle grinder that can work easily in tight spaces, this could be the model for you. Definitely, the motor only has a limited output, mainly because it is so small. However, Bosch has worked hard to squeeze as much power out of the motor as they can. Since Bosch has such a great reputation for design, it’s a shame that they’ve dropped the ball on a couple of issues. For one thing, the side mounted handle only fits on one side of the tool, making it less effective for left-handed users. The power switch is also strangely placed to one side, which means that it can be knocked during use, stopping the tool when you don’t want it too. After two smaller sized devices, the next tool on our list kicks it up a few notches! 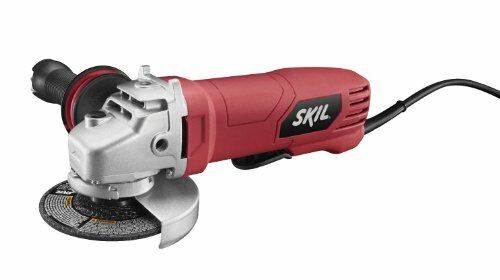 Boasting an 11-amp motor, this is by far the most powerful angle grinder we’ve looked at on the list so far. All that power is also backed up by the famous DeWALT build quality, so could this be the right tool for you? The big stand out is the 11-amp motor, but there are a lot of other features built into this tool. For one thing, it has a very durable and very efficient dust ejection system that ensures a debris-free cutting area. This product also comes with a handle that can be placed either on the left or right side, as well as a one-touch guard and wrench. We’re pleased with the dust ejection system, as dust is a big issue with angle grinders since they can create an awful lot of the stuff. The motor is also good as it has an excellent weight to power ratio, which means it can throw out 1.8HP. In operation, the guard can rotate a full 360 degrees while the blades are changed out with a simple one-click operation. That makes the tool both easy to use as well as easy to maneuver into tight spaces. There are only really two issues with this product. The first is that it is pretty heavy, weighing in at over six pounds. Nonetheless, that is acceptable especially when you consider that a lot of that weight is used to accommodate the big, beefy motor and its power output. The second is that although the handle is two-sided, it is attached at an exact 90 degrees with no ability to change its pitch or position. Holding your hands at 180 degrees relative to each other (one on the handle, one on the body) is not the most comfortable position to be in as it makes the tool harder to hold and, ultimately, harder to control. Our next product comes from Skil, a company that is not as well-known as some of the others on this list. 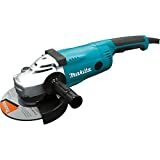 Still, they’ve managed to produce an angle grinder with some interesting built-in features that stand up well to the models from some of their more famous competitors. Coming in at a size dimension of 13.1 x 5.5 x 5.5 inches and approximate weight of 6.1 pounds, this tool is loaded with a 7.5-amp motor that can produce a maximum speed of 11,000 RPM. It is also equipped with a non-locking paddle switch that allows the unit to switch off automatically once it is dropped or released. Your purchase comes with a handle, a metal-grinding wheel, and a wrench. Aside from that, this is a pretty basic model of an angle grinder. It has a nice, sturdy all-metal gear housing and the attached handle is designed to reduce vibration. An eight-foot power cord rounds out a short but effective list of useful features. Like we said this has a pretty basic design, but that doesn’t mean it's not a good tool. For example, the motor is pretty powerful, and the vibration-dampening handle is a useful feature to see. Then there is the lock-free paddle style power button. This is actually included as a safety feature. It’s designed so that power is only applied as and when you need it, instead of having a constantly rotating blade, but whether that’s a good thing or not, it’s up to you. Well, for one thing, there’s no way to lock the power button. For some, that makes this a safer model of an angle grinder while for others, it means it’s less comfortable during prolonged use. This tool is also pretty heavy, considering that the motor only puts out 7.5 amps of power; hence, that is a relatively poor weight to power ratio. Its metal gear housing, while being very rugged and adding to the product lifespan, is also pretty heavy. Add in the fact that blades have to be changed with a wrench attachment, which is fiddly and time-consuming, and you have a budget model that ultimately may not be worth the money. Also, the handle is mounted at a flush 90 degrees with no ability to reposition it, which can hamper ergonomics. We finish up with this model from Makita, an absolute beast of an angle grinder. Not only does it boast the most powerful motor it is also stuffed full of useful features. It also carries the biggest price tag on the list too, so is it worth the big bucks? This product has a motor that is packed with 15 Amps of power that are delivered to seven-inch blades for the ultimate cutting action. This machine also has a labyrinth style internal layout to protect against dust damage and soft-coated grip and handle combo for comfortable use. The wheel guard can be adjusted and clamped easily without the need for a tool and has both AC and DC switches. The best thing to say about this tool is that with the power it packs, along with those huge blades, it has the capacity to take on just about any job around the home. 15 amps will be plenty of power to cut through just about anything, so if you invest in this product, you know it will cover all the bases, angle grinding wise. That labyrinth internal layout is also great to see. It essentially protects the motor plus the bearings and other internal moving parts from any penetration by dust or debris. That is really going to help extend the lifespan of this tool which, since it is something of an investment given its price tag, is something you do want to see. This tool is a beast and not just in terms of the power it puts out. It also weighs 15 pounds, making it by the far the heaviest angle grinder on our list. It’s also, of course, quite big in terms of length and width, so you may struggle when you work in smaller spaces. With so many great machines, how do you really pick the right one? Well, you can start with our handy buyer's guide that walks you through some of the key features that you should bear in mind while you are making your decision. When it comes to power supply, angle grinders typically come in two types, and choosing the right one to suit your needs is very important as both have pros and cons that make them better suited for different roles. Cordless tools have better mobility but are often of lower power overall and require constant charging since they operate with the help of a battery. On the other hand, corded tools have less mobility, as they have a cord and need to be connected to a power outlet on the wall or an extension cord. That does mean that they get a constant supply of electricity and are generally the more powerful devices. There is a wide range of cutting disc sizes out there, but for models designed for use in domestic settings, such as DIY or home improvement projects, these tools will typically fit a four or seven-inch disc. The four-inch disc is, of course, smaller, allowing it to work in more cramped conditions while seven-inch discs provide more cutting power, making them more suitable for prolonged jobs or cutting through tougher materials. We’ve talked a lot about motor power in our reviews because it is one of the most important considerations when it comes to choosing the best angle grinder. That said, you don’t have to go for the most powerful motor on the market. It can be important to have a powerful motor if you anticipate that you will be doing a lot of cutting with your projects or if you will be working with tougher materials. A smaller motor, on the contrary, will often be housed in a smaller device, giving an angle grinder excellent maneuverability. This is essentially how many times the cutting disc will rotate in a set time or a minute. That gives you the unit RPM (rotations per minute). Angle grinders have speed level ranging anywhere from 5,000 to 11,000 RPM. The higher the speed, the more power is delivered through the disc. Finally, angle grinders are one of those tools which you should certainly consider their weight when making your choice. There can also be quite a degree of variation in this, with the tools on our list having a weight range that went from 3.5 pounds all the way up to 15 pounds. The lighter the tool, then naturally, the easier it will be to hold, making it well designed for use over extended periods of time. On the other hand, always remember that weight is a trade-off with power, so the lower the overall weight, the weaker the motor will be. An angle grinder is a power tool that is designed to cut, sand, and grind materials such as wood, metal, and concrete. It does this by rapidly spinning an attached disc, onto which a range of attachments can be connected. Once you’ve built up a bank of attachments and discs, there is no end to the range of tasks you can put your new tool into. For example, with a grinding disc attached, you can sharpen other tools like garden shears, shovels, and spades. With a cutter attachment, you cut through wood and metal, and with the grinder, you can buff a tough surface clean. Literally anything from masonry to rusty metal. Angle grinders are uncomplicated tools. Just as with any power tool, it does pay to read some guides to their use before you jump in and get started though! Well, the best thing to do is to read our breakdown of the key features of these types of tools above and see which ones are most important to you. For example, if you need to use a tool in a confined space, say you need an angle grinder for working on your car, the size may be the most important feature, as you need a tool that can be easily manipulated in tight areas. Other people will use the tool as part of construction jobs or DIY projects around the home. In this case, power could be the key consideration. It’s the same as selecting any other tool, simply take note of what and where you will be using the tool and select the features that are most important to that task. Broadly speaking, there are two ways to change the blade on an angle grinder, and it will depend on the design of the tool which one works for you. Some models have quick-release mechanisms wherein you will usually be able to remove the blade with the click of a button. Others will require a small wrench to be used to tighten and loosen a central bolt that holds the disc in place. The Makita GA7021 Angle Grinder, for us, ticks enough boxes to be the number one product on our list. It has the power to tackle any job that can be thrown at it while still being comfortable to use because of its ergonomic design. It does carry a big price tag, but it is also a very good long-term investment that, given its labyrinth internal layout, should be able to repay that investment with years of useful service.